I saw this production last Saturday in NYC amidst the rain and storm of that day. I am still choked up from this show. In fact, I haven't been moved by a production since I saw Grey Gardens last year. 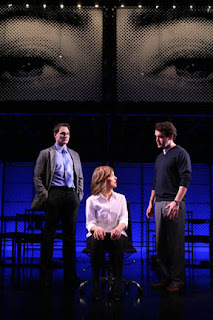 Next to Normal is an off-broadway musical presented by Second Stage Theatre. It's directed by Michael Grief (director of Grey Gardens and RENT) with music by Tom Kitt (High Fidelity) and book and lyrics by Brian Yorkey. It is a musical about a family struggling to cope with Bi-polar disorder which primarily imprisons Diana, the mother, played wonderfully by Alice Ripley. 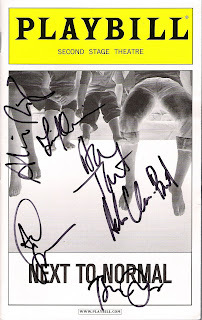 Dan (the father) played heartbreakingly by Brian D'Arcy James is the emotional center. Natalie (Jennifer Damiano) and Gabe (Aaron Tveit) are the teen age children. Diana battles with the highs and lows of depression vs. the numb feeling of being on medication that sometimes works and sometimes not. Dan in turn fights to keep his family afloat and together despite the chaos. He is the constant......the "catcher" when Diana falls. Not a very light topic and difficult to musicalize. 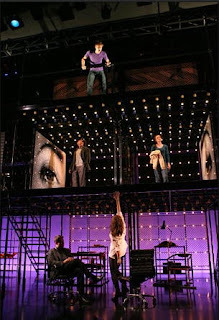 But Tom Kitt's pop/rock music and Brian Yorkey's lyrics works so well with the topic that it evokes feelings of conflict....that of love and anger, frustration and hope, loss and acceptance. There were a lot of counterpoints (where 2 or 3 characters sing the same melody but different lyrics) in the songs.....mom and daughter singing, father and son.......each with different yearnings or sometimes intentions......further giving a juxtaposition of mixed emotions. Combined with the amazing singing and acting from the cast, the show makes the audience really care for the characters. By the second act, I found myself so involved, getting choked up and wiping tears whenever a character is in pain. The set is a 3 tiered set which also incorporates the band (drums and strings on the 3rd tier, piano on the 2nd) and has moving panels that open and shut that further gives the feeling of being trapped. It's really an amazing set housed in a very intimate theatre making it so effective. I also particularly enjoyed the way the book was structured. That the story was layered and piece by piece it was peeled revealing more about each character. It kept me really engaged. That night, the whole cast was perfect vocally but I believe special mention should be given to Brian D'Arcy James because whenever he started singing I would literally get goosebumps. He was just so heart breaking. I hope a CD would be made because the score is really wonderful. Try to catch it if you can.....they extended only a week and last performance is this Sunday but hopefully this show will somehow find it's way to Broadway. Oh....Broadway celebrity sighting at the show....Matt Cavenaugh (Grey Gardens and A Catered Affair), Jenny Powers (Grease) and Michael Grief!!! Oh before I forget, I saw David Stone (producer of Wicked and Spelling Bee) observing the audience from the balcony as Act 1 and 2 ended. Was he there to see the audience reaction to the show? Maybe.....let's hope he brings it to Broadway!